Neil Coleman | Author of Roskill and Talk to Me: Family fights against the scourge of 'P.' (Methamphetamine)---A story of hope and love! Family fights against the scourge of 'P.' (Methamphetamine)---A story of hope and love! A family travels to Auckland to find employment after redundancy claims yet another victim. Things seem to be going fine; there are new sights, sounds and certainly more opportunity to explore a ‘bigger pond.’ Perhaps the ‘pond’ is a bit toxic and has hidden secrets. We are all tempted from time to time by what life throws at us, but sometimes the results can be disastrous for families if one member takes a step just that much too far. ROSKILL, BY NEIL COLEMAN, explores what can happen when John (the dad) enters the dark and dangerous world of ‘P.’ He risks losing the family he loves as they struggle to come to terms with his new ‘demon.’ It is the courage of his partner that challenges the ‘hopelessness’ of John’s new world. 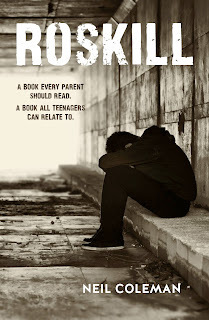 Above all, ROSKILL is a story of hope; along with a humorous at times depictions of what life can be like for teenagers, who witness the behaviours of those who ‘tell them what they should do,’ but then exhibit something entirely at odds with family values. Go to my website and download ROSKILL to your Kindle or other reading AP. You will also be able to order hard copy soon as that becomes available on demand from Amazon. MY website is undergoing a revival but it still works in the old format.